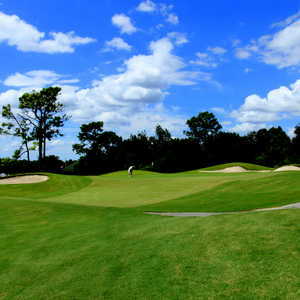 The 18-hole Pine Ridge at Pine Ridge Country Club in Beverly Hills, FL is a semi-private golf course that opened in 1982. Designed by Brian Almony, Pine Ridge at Pine Ridge Country Club measures 6320 yards from the longest tees and has a slope rating of 118 and a 70.2 USGA rating. The course features 4 sets of tees for different skill levels. 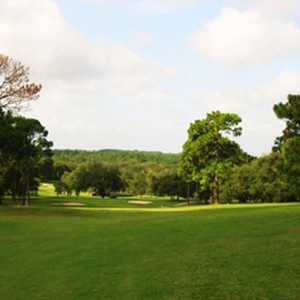 Pine Ridge Golf Club in Beverly Hills, Florida sits quietly in the middle of the 4,800 acre Pine Ridge Equestrian and golf community in Citrus County. This family owned golf club is under new ownership and PGA Professional and CEO Bryan Richard sees nothing but a bright future for his new club. Over the past two years the course had been severely neglected. In fact, there were originally two courses on the property: a par-72 championship course and Little Pines, a par-3 executive course. Little Pines is currently closed as management and staff is focused on restoring the main course to its former glory. The tee boxes and greens on the Little Pines course are still being closely monitored, watered and fertilized in anticipation of reopening the course. A firm date for that has not yet been set. Pine Ridge sits about 160 feet above sea level. 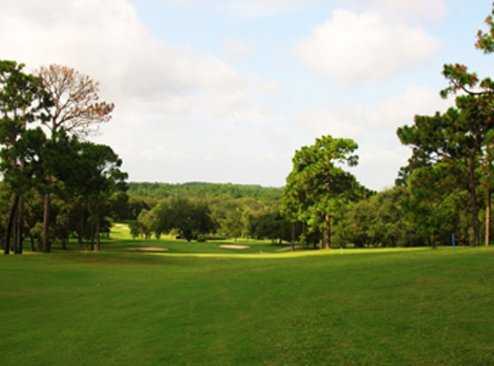 The course features gently rolling hills; a very unique feature in this part of Florida's west coast. At 6,247 yards from the back tees, you might get the idea that you’re going to have your way with this course, but don’t let the numbers fool you. What Pine Ridge lacks in length, it makes up for in narrow, tree lined fairways and small, elevated greens. Pine Ridge is all about the approach shot. From the White tees (5,884/68.7/121) there are 7 par 4s that play less than 350 yards. That means a lot of wedges and short irons into the greens. You’ll need an exceptional wedge game if you want to score well. Odds are you’ll be facing a lot of up and downs just to make par. Most Memorable Hole: Number 8, Par 5, 483 yards. A good drive to the top of the hill sets up a risk/reward situation and the opportunity to go for the green in two. You’ll need to avoid the trees on the right and the lone fairway bunker on the left off the tee to give yourself a chance. A long draw would the preferred tee shot. From the top of the hill the hole starts to dogleg to the right and plays downhill, making a drive down the left side an easier approach. Fronting the right side of the green is the only water hazard on the course. The small, narrow green only adds to the difficulty of the hole. Favorite Par 3: Number 5, 163 yards. A moderate length par 3 that demands accuracy off the tee because of the tress that line both sides of the fairways. The small green is long and narrow with sand all around which can make for a tough up and down. Favorite Par 4: Number 7, 348 yards. A hole doesn’t have to be overly long in order to be difficult as evidenced by Pine Ridge’s #1 handicapped hole. It features the narrowest fairway on the golf course. Many players will choose to play an iron off the tee, short of the fairway bunker on the left, leaving a long to mid iron into the green. More aggressive players who hit driver successfully will carry the bunker and leave themselves a short iron or wedge in. Number 7 has one of the largest greens on the course; just be sure to carry the two bunkers in front of the green or face a tough up and down. Favorite Par 5: Number 13, 473 yards. If a fade is in your shot repertoire off the tee, now’s a good time to use it. This severe dogleg right requires a left to right tee shot down a narrow tree-lined corridor. Hit your tee shot through the fairway left or too far right and you’re in trouble. The narrow fairway gets narrower as you play uphill towards the green. It will take a tremendous deal of accuracy to hit this small green; beware of the bunker short left. In addition to a par-72 championship course, and a par 3 executive course, Pine Ridge has a good size putting green, a driving range, and short game area. The chipping and putting areas are the perfect place to improve your short game. The driving range at Pine Ridge is only about 200 yards long and is the perfect place to warm up your iron game. The practice green is the perfect place to get the speed of the greens before heading to the first tee. Pine Ridge has partnered with Citrus County Parks and Recreation to offer youth and group golf lessons. In case you’re struggling with your game, they offer Golf Tune up specials with their in house PGA Professional, Bryan Richard. Call the pro shop and schedule a lesson. Last Word: The championship course at Pine Ridge features challenging woodland holes with rolling fairways that are not crowded with home sites; in fact the houses that you do see sit well back from the fairways. If you’re looking to grab a bite to eat before or after your round, The Pub at Pine Ridge is the perfect place. After your round, unwind with your favorite adult beverage from the fully stocked bar as you relax and enjoy the natural surroundings. The food is great, from tasty buffalo chicken wings to mouth watering burgers to some of the best flatbread pizza I’ve ever had. The bar & grill is open daily. If you’ve recently moved to the area and are looking to upgrade your social status and at the same time enjoy a quality golf venue, look into becoming a member of Pine Ridge Golf Club. 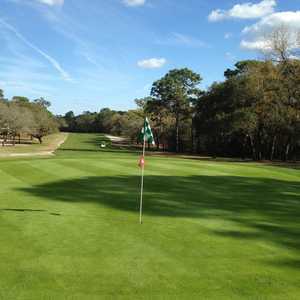 All memberships include unlimited greens fees and cart fees, range balls and preferred tee times. Single and family memberships are available or, if you’re just a part-timer in these parts, seasonal memberships are available. Check out the website for more information. 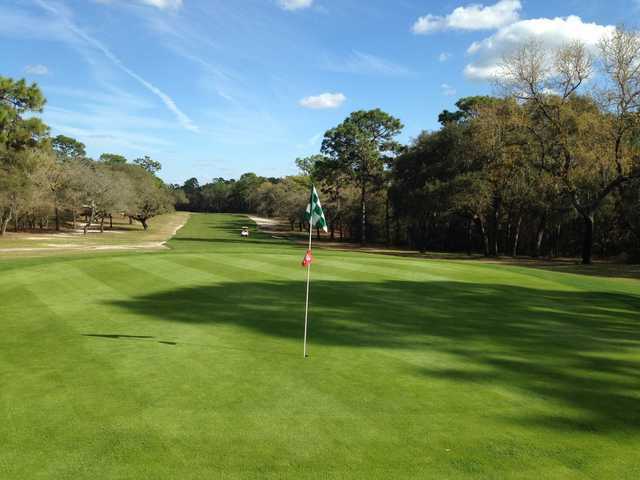 Pine Ridge is much more than just another Citrus County golf course, it’s a great place to host family get-togethers, prom nights, anniversaries, or any other special occasion. The professional staff at Pine Ridge is committed to helping you make it successful. They offer a variety of hassle free event packages to choose from or they can customize one to fit your specific needs. This course has been deteriorating over the past several years but there is now a new owner/new management in 2018. The vast improvements to the once decrepit course are noticeable and appreciated. There is actually grass on the course and the greens. The new owner is on-site, he is friendly and has completely flipped this course from a non-playable course to an enjoyable course. The staff seem to be continually making progress to save this golf course. It's not in perfect shape yet but it's well on its way. In the Spring of 2018, we played Pine Ridge (then called Highland Hills) and vowed to never play there again. With new ownership, we decided to give the course another try. We are thrilled with the condition and will now play there often.